Become the best direct seller you can be! Direct Sales Inspiration provides affordable, in-depth training courses specifically for direct sellers or party plan consultants. All courses use video presentations to talk you through the subject. Every Module comes with bonus worksheets, images, workbooks, or done-for-you printables that you can use in your biz. If your Facebook page is stale, you’re not sure what to post and there’s very little interaction happening….you need to up your game! 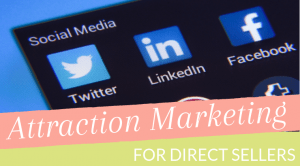 Learn exactly how to do that in the Attraction Marketing for Direct Sellers course. With attraction marketing you will become a magnet, attracting people to you instead of pushing them away with spammy or salesy posts. Have you sponsored anybody into your team yet? If you have trouble growing your team or you have trouble even talking about the business opportunity – this course is for you! 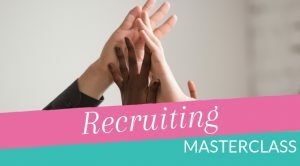 The course takes you through what to say, recruiting games you can play, what to add to your display, how to find new team members outside parties, how to follow up and more. If you want to grow your business, do yourself a favor and check out this course. If you find yourself not talking about bookings or the business opportunity….if your guests aren’t really interacting with each other or if you want more repeat bookings – you need games! 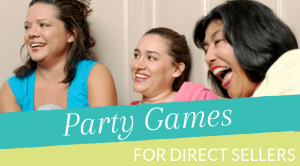 Games are the #1 secret weapon in your direct sales or party plan biz. When people play games, they’re having fun and when they’re having fun it’s easier for you to get your booking, sales or recruiting message across. This affordable bundle comes with 26 games and short videos will teach you how to make the most of them.